The most basic insurance coverage type is one that pays for the damages caused to the structure of the house and its outer buildings including garages, sheds, etc. A second type provides reimbursement of losses caused to personal property in the home. These include goods such as furniture, home appliances, gadgets, clothes, etc. The type of damages and causes are mentioned in the terms of the insurance policy. Another type of insurance covers the damages caused to the home while living in it, and thus, pays for the repairs required. One can even create insurance coverage to pay up for the damages caused to someone else’s property. Certain insurance companies may not provide for some specific type of damages, depending upon the geographical location and other natural conditions. For example, in areas receiving high winds or hail storms, the policies may not offer insurance against damage caused by them. In case of a total loss, the amount of coverage provided depends upon the contract terms and conditions. 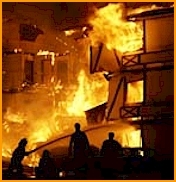 Certain policies may provide only a partial coverage to out buildings or other structures. Before choosing a home insurance plan, one needs to decide how much coverage to sign up for. This would depend on one’s judgment of their future financial situation, and accordingly how much they would be able to bear out of pocket in case of a total loss. Thus, it is always wise to go for a full coverage, if it can be afforded. While one chooses for a full coverage plan, it is better to opt for a full coverage replacement plan, since it pays the amount that would be required to buy the property that has been damaged. Whereas, full coverage actual value plan would pay the amount that the damaged property is worth today in the market, after cutting its depreciation value. Before buying an insurance policy, always compare the coverage plans offered by different insurance companies, and then choose the best product that meets your needs.